We all know that kids say the funniest things, but do we know why? 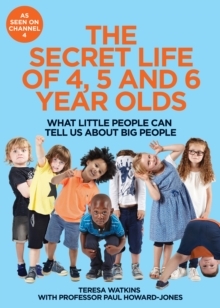 The Secret Life of 4, 5 and 6 Year Olds has quickly become must-see television, as each week we are given access to the hidden world of children when adults aren't around. Since the first episode was broadcast, over a hundred children have been featured and their tears, tantrums and laughter have provided the best drama on television. In this official companion to the award-winning Channel 4 show, written by Executive Producer, Teresa Watkins and neuroscientist Paul Howard-Jones, we relive some of its funniest, most touching moments and explore what's going on in the heads of little people when big people aren't around. It turns out that we can learn a huge amount from them. Full of amazing moments, sharp insights and fascinating science and full of beautiful photography, this is a celebration of the extraordinary lives of children and a reminder that we are all closely connected to our four-year-old selves.